Since all stock is in the hands of our distributors, contact them directly. For support, product selection and evaluation samples. Your beautiful gift of cut florist roses and other flowers are NOT suitable for use to propagate new plants from cuttings. HOW TO and alternative methods to grow a Christmas tree. E-Mail the information below. What plants are you interested in ... what do you want to grow or propagate? 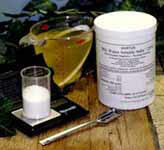 The Salts are 1/3-1/5th the cost, and are superior to "Research" IBA/KIBA and "DIP" alcohol based "Rooting Solutions".